If you ask most people what the worst chore in the house is, they will respond “cleaning the toilet”. Well, after you learn how to clean the toilet properly and keep it clean, it may not be such a downer anymore. There are a couple of ways to clean your toilet depending on how dirty it is and how often you clean it. Use the one that would be most effective for you. Spray the toilet with cleaner. Using toilet brush, scrub the bowl. Spray bathroom cleaner on the lid and surrounding areas of toilet and wipe with the paper towels. Don’t forget to wipe down the body of the toilet; use a toothbrush in hard to reach areas, if necessary. Best tip is after you clean the bowl, start from the top and clean to the bottom of the toilet. Time to FLUSH!! 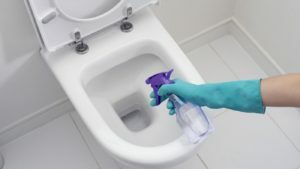 You may need to flush more than once to make sure that all of the chemicals (which can sometimes have a hue to them or suds) are out of the bowl. If it looks like a warzone in your toilet bowl, you may need a little more than basic cleaning. In that case, follow the steps for deep cleaning. After you deep clean you toilet, you can use the basic steps as long as you clean your toilet on a regular basis. Spray down entire toilet (except bowl) with bathroom cleaner. Allow it to sit and work while you work on the other areas. Apply toilet cleaner to the bowl of the toilet. Use special attention to the rim area where there may be grim and buildup. Flush the toilet and continue to brush as the water flows to help rinse away grim. Wipe down the rest of the toilet. Spray disinfectant cleaner on the toilet and wipe down again. Start at the top of the tank and wipe every surface area all the way to the floor. Don’t forget to wipe the handle. This small handle has lots of germs so be sure to disinfect it every time you clean. Flush again to insure all the cleaning product has gone down the drain. Stains can be caused in toilets by hard water, soap deposits, rust, lime scale and other things beyond our control. Here are a few ideas (some are unconventional) on how to remove those stubborn stains. Cleaning products such as acid – Some examples of this are hydrochloric acid (which is intense) or a mild version such as cleaning with a vinegar solution. Using a pumice stone – apply slight pressure directly to the stain. Use caution; continued use of the pumice stone on porcelain toilets can cause scratches. Coca-Cola will remove the stains from your toilet bowl. Just pour into the bowl and let sit about an hour before scrubbing and flushing. Alka Seltzer tablets will also work on stubborn stains. Allow them to dissolve before flushing away your stains. A paste of lemon juice and borax applied directly to the stains and rings will help in their removal more effectively than most toilet bowl cleaners. Using paper towels for cleaning the exterior of your toilet is more sanitary than a cloth since they are disposal. In addition, the lint-free paper towels won’t streak up your toilet. Don’t wear nice clothes when using heavy chemicals to clean your toilet; the chemicals may stain or ruin the clothes. Always wear gloves to protect your hands. Using the least harsh amount of chemicals possible to clean your toilet is best for those in your home. Harsh chemicals are dangerous to not only yourself but to children and pets when inhaled or ingested. Don’t use the toilet before all chemicals have been cleaned off of it. In addition, to prevent the spread of germs – don’t use the toilet brush on all surface other than the toilet bowl itself. With the regular care and cleaning of your toilet, the chore becomes easier and not such a task.